Lock bumping is a popular technique used by criminals to open cylinder locks and deadbolt locks by using a specially designed key called a bump key or 999/ rapping key. The lockbumping technique is quite powerful and allows a large variety of locks to be opened in no time. This post explains what lock bumping is, and how you can prevent criminals to bump your locks and gain entry to your property. According to statistics provided by the National Crime Prevention Council (NCPC) and the Department of Justice, nearly 2/3 of all break-ins occur with no sign of forced entry. This number matches with what we are seeing when we visit our customers. Unlocked doors and windows still pose the largest security risk, with lock bumping as a close runner up. Lock bumping has gained popularity in the past few years due to the simplicity and effectiveness of this technique. Tutorials on Youtube, and online shops where 3D printed bump keys are available from $2 have made the lock-bumping technique widely available and accessible to anyone. According to our own experience no traditional lock is bump proof and with a proper bump key, burglars can open 90% of the locks in less then 20 seconds. More alarming is that many of the newer locks are even more prone to bumping as compared to the old locks. With a bumping key it's possible to open most locks in less then 10 seconds. More then 90% of American doors use an old style cylinder lock which is vulnerable to lock bumping. Over 95% of brand new locks from hardware stores like Home Depot are vulnerable lock bumping. Lock bumping is so easy that even a 14 year old child can do it. Lock bumping is non destructive: there is no sign of forced entry or damage when a bump key is used. A bump key can be made by anyone in less then 5 minutes. 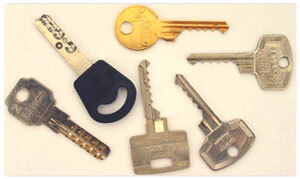 Bump keys are special keys cut to take advantage of the mechanics of pin tumbler locks. Basically it is a standard key that has all the cuts (valleys) at maximum depth so that it can fit it into all locks. 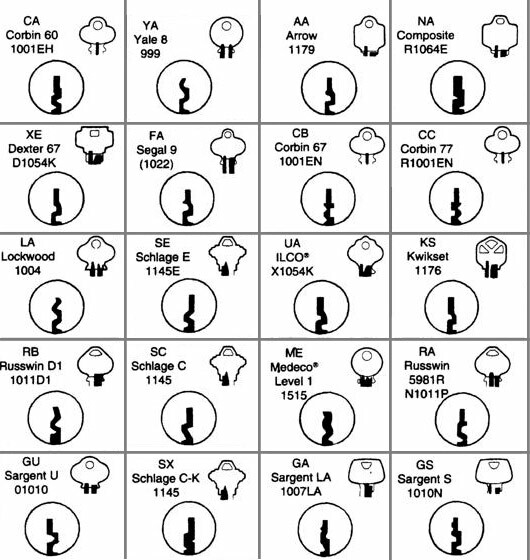 The picture shows bump keys for various locks, where the valleys are set as low as possible (into 999 position). First a bump key must match they key-way of the lock, (the part of the lock where the key slides into - sidebar image) If the bump key physically fits into the lock, there is a good chance the key will open the lock. On Ebay anyone can buy a complete bump key set for about $20, which will enable to open virtually any lock, and in case criminals do not want to order on-line, they can create a home made bump key with an old key and a triangular file pretty easily. With a set of 10 bump keys with different profiles to match the most common key ways, criminals will be able to open about 90% of all the common locks, even expensive high security locks. To bump a lock, the bump key is entered in the keyhole and then is tapped by a hammer or screwdriver, this will bump (force) all the tumblers (or pins) inside the lock above the shear line. ()The effect can be compared with a pool cue hitting billiard balls). In the split second that the pins are in the perfect position, the lock only needs a little torque in right direction and the lock will pop open. The bump key pushes the pins up for a split second so that the plug can turn and the lock is opened. Animation by Toool that illustrates how bump keys work. Now that you understand how it works, you should get an idea how easy lock bumping is, watch this news video from CBS 5 and see how a ham-fisted reporter opens several locks within a matter of seconds. Bumping can be learned in less then an hour and requires almost no skills. With bump keys and tutorials being readily available for sale on-line ( or even freely available), lock bumping has become one of the the most effective tools in the burglar’s arsenal. Even though several State and federal laws prohibit the distribution of “locksmithing devices” to anyone other than lock manufacturers or others with a recognized legal purpose, lock bumping is still gaining popularity. Obviously its impossible to control or prevent the manufacturing and sale of bumping tools. Another serious concern arises with insurance companies as lock bumping does not leave forensic traces or signs of forced entry. This poses a problem with many insurance companies refusing to pay legitimate claims where a lock was opened by bumping. It is advisable to check your policy to make sure your insurance company will pay regardless of how the thieves got in. Is your lock vulnerable? If you purchased your locks from a local hardware store or large retailer like Home Depot or Lowe’s, most likely, yes. Any locksmith worth his salt will warn you that mass-produced locks that you can buy at any run-of-the-mill hardware store do not do a good job of keeping your family, your property, and your possessions, safe. The main problem with these locks is that they are “keyed alike” or in the best case scenario share the same key way profile which makes creating, or buying a pre made bump key for these type of locks a piece of cake. Also, in many cases, these locks do not have pick guards, which makes them an easy target for lock picking. Professional lock manufacturers like Medeco, Schlage, Miwa, Dorma, Assa and Kaba all created their own version of bump-resistant or bump-proof locks. These are high security cylinders, often with a UL 437 or equivalent rating which are harder to to pick or manipulate. Some manufacturers have implemented patented sidebar mechanisms and/or anti-bumping pins within their standard cylinders that will also frustrate the practice. Another anti-bumping technique for increased security is shallow drilling, in which one or more of the pin stacks is drilled slightly shallower than the others. If an attempt is made on a lock that has shallow drilled pin stacks, the bump key will be unable to bump the shallow drilled pins because they are too high for the bump key to engage. Tip: Check your locks for the markings in the photo underneath, if your locks are marked like this, they are high security locks and very hard to bump. There are number of techniques you can use to prevent lock bumping and make your home and business more secure, all come with a different price tag and offer a different level of security. As with many things, protection is a matter of what you’re willing to spend. A simple way to increase the security of your home is by installing chain latches to your exterior doors. This doesn’t affect your lock’s susceptibility to bumping, but it provides an additional layer for a criminal to bypass to gain entry. Modifying your existing locks and deadbolts is a cost effective way to make your locks more secure. A certified locksmith is able to make modifications (by adding security pins) to many existing cylinder locks in order to increase the resistance to bump keys at a much lower cost then replacing the locks. Generally this option makes bumping somewhat more difficult but not impossible. If security is paramount and you want to sleep comfortably with the knowledge that your house is officially bump-proof, you can install new high security smartlocks like the Abloy deadbolt on your exterior doors coupled with a common-sense frame and door reinforcements. These are high security deadbolt locks that are difficult, but not impossible to manipulate. BiLock offers a lock with programmable side bars and has no top pins, these locks are not vulnerable to bumping and also nearly impossible to pick or manipulate. Your local locksmith can advise you on the best lock for your situation, based on budget and desired level of security. Another option is installing non tumbler locks such as rotating disk locks, or magnetic / electronic locks. An electronic lock is not vulnerable to lock bumping and uses electric current to drive its locking mechanism . Electric locks employ magnets, solenoids, or motors to activate the lock by either supplying or removing power. Electronic locks can also be connected to an access control system to further strengthen the security. Home security works in layers and is like a chain, it is only as strong as the weakest link. Lock bumping forms a serious threat, but unlocked doors and windows still pose the largest security risk. Do not give a burglar the opportunity to break into your house and use your common sense: Lock your doors and windows if you leave the house, install motion lights in your garden, be careful with issuing spare keys, and don't give thieves and burglars an opportunity to hide in your garden. A Security system, a good quality safe, and a big noisy dog certainly don't hurt either. Our best advise is, call your local locksmith or security company and have a certified professional audit your home and your locks. In many cases you don't need an expensive home security system to keep your home and your loved ones safe. A certified locksmith is experienced in finding the weak entry spots at your house and qualified to give you solid advise that fits your budget and meets your specific needs. 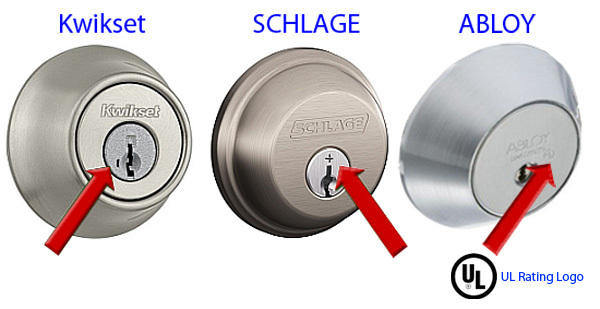 The illustration i made shows different keyways from Schlage Locks. In order for a bump key to work, the keyway must match.